In the event you think your stock ROM is faulty, or you want to flash back to a previous version on your Samsung device, here is how. 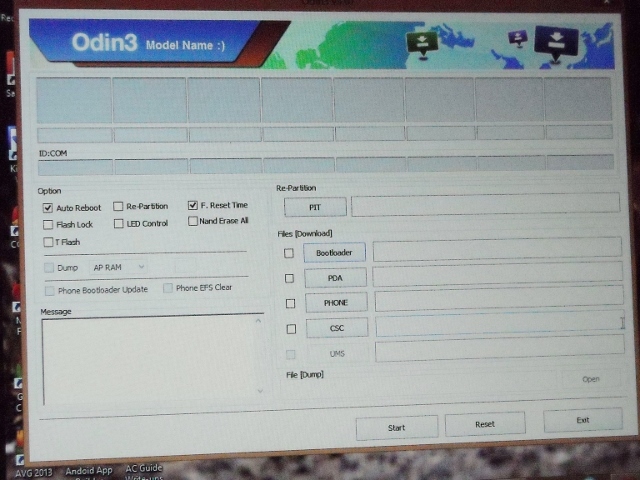 Odin is a program that can utilize the MD5 file to install ROMs to your device. MD5 files can be anything from recoveries, modems, and even ROMs. First, one of the things that may need to be done is to update your device drivers. You can do this one of two ways. -You can search the net for your updated drivers. Download and then install to your PC. -Or you can download or update Kies. Part of those processes are to install or update drivers. Once drivers are installed, a restart of your PC may be required. In fact, I would highly suggest it. Second, is downloading and installing 7Zip. 7Zip is a file extraction program, that unzips compressed files. Windows has a file compression and decompression program as well. Depending on where you get your file from, having both is handy in case one works and the other does not. Third, Your copy of your stock ROM. This will be the compressed file you downloaded. You will need to extract it. The best thing to do is create a file on your desktop. This will make the extracted file easier to find. Once created, you can right click on the downloaded file and click Extract. Either program will ask where to extract to. Click on the small box with the 3 dots and navigate to your desktop and locate your newly created file. Next, you will need to download and install ODIN. This is ODIN just after the program has been launched. 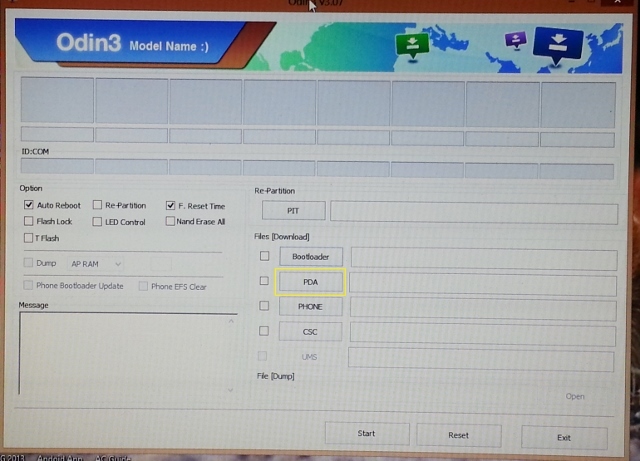 The MD5 file would go into the PDA box. Sounds weird, I agree, but the PDA box will be your best friend. You don't need to worry about any other Boxes. This is the PDA box that will be needed to flash any file. Once the file is in the box, you would now need to turn off your device, and reboot into Download Mode by holding volume Down and power (If using the Galaxy S3 and 4, Home will also have to be held). This is the first step to getting to Download Mode. This is what Download Mode actually looks like. Once in Download Mode, you can plug in your device. You will need to wait several minutes, as ODIN, your PC, and the device all talk to each other. After some time has passed, upward of several minutes, you should see a box that is colored and has a type, and a number: Ex: 'COM:6' That means your PC recognizes the device and everything should be ready to go. The number is irrelevant. 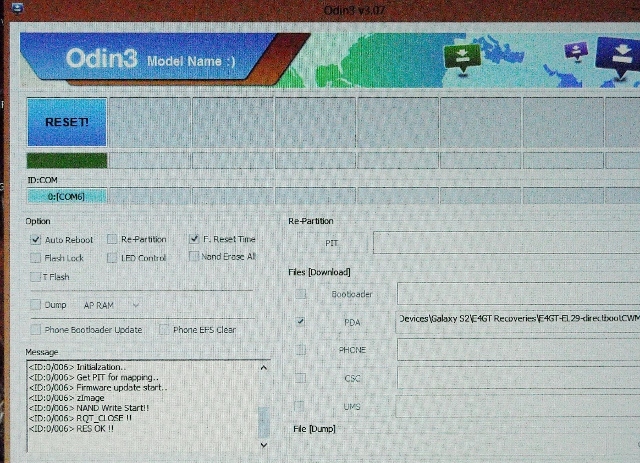 Note the COM:3, and the MD5 file in the PDA box. Now, to begin, just click Start. When ODIN is done, you should see a box that will say reset or passed (depending on which version you have, you may see either or both.). At this point it is ok to remove your device. ODIN fishing up it's process. Testing the reset. ODIN has completed the flash, and by now, the device should be going through the reboot screen. Any problems, try these few things: Update Drivers, and restart your PC; Different cables; Different USB ports. Other solutions may include redownloading the file. Paul627g, B. Diddy, beastuct and 22 others like this. Afterthoughts: Flashing full ROMs can also take upwards of several minutes. Before beginning this procedure, a charge of at least 70% is recommended. Also, this will be like unboxing the device for the first time, so the reboot will take longer than normal. You may also have to go through setup procedures again. I think that I love you...no homo. I am currently looking at my S4 screen saying "Android is upgrading..." and it makes me happy. Thanks for the basic instructions and solid links. No sweat. Glad it helped. See you in the forums. Can you link what file? Glad you like it, and glad it helped. Just click post new thread, and say hi with a little about yourself. Will be doing this tomorrow to my friends SG4. 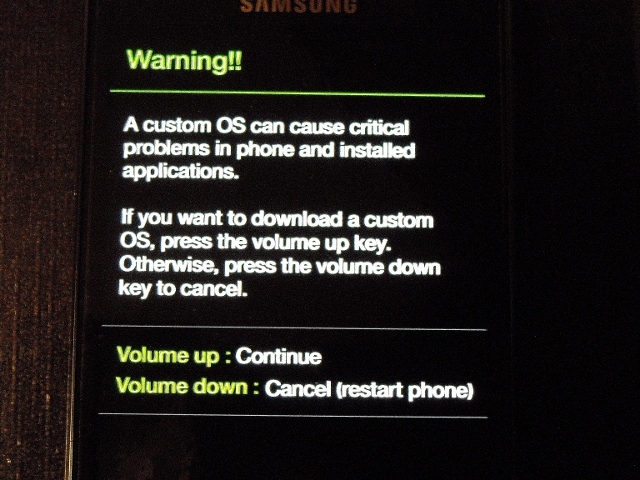 so i bricked my s4 and it is in download mode..
ive done all the above steps. and found my stock rom. followed everything and it says FAIL. Try updating drivers, different cables, different ports. Anybody have a link for T-Mobile GS3? Please forgive me for being such a noob, but I'm trying to really, fully reset my son's Galaxy Tab 2 10.1, so I turned it off, held down the Volume Up button and powered it on. I opted to continue, and it's been sitting at the "Dowloading...Do not turn off target!!" screen for about 20 minutes. What should I do at this point? Is it okay to "reboot" the unit? Thanks so much in adamant for your help. Press and hold power until the tab reboots. Did you just mean to do a factory reset or wipe the device? Thank you so so much... I have been months trying to figure out how to get my rom back to stock. This did the trick and I am now back in business! Welcome to the forums. Glad it helped. 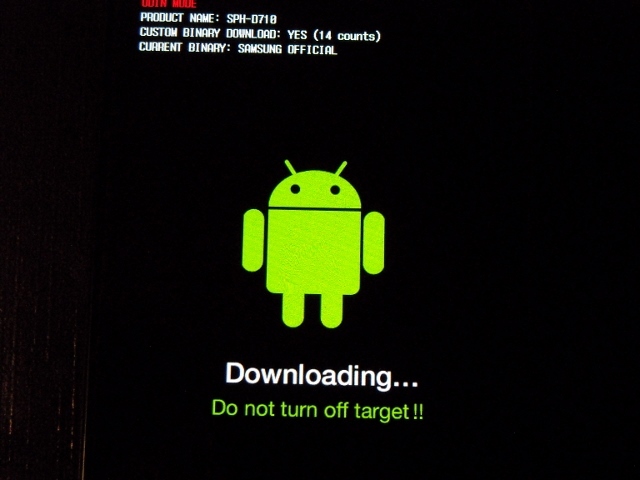 hi can i flash also cyanogenmod 10.1 on galaxy w? because on the guide it says that i must use cwm5 or cwm6 uf not i will risk my phone. using odin is okay? 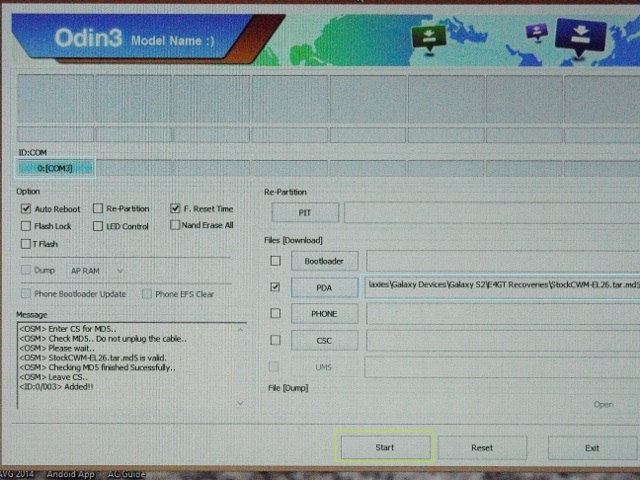 Hi, I already change the cable, update the driver, using different ports but still failed to flash stock rom. Is it my stock rom faulty? Because i use this stock rom before and works fine. Then I flash custom rom, and today I decide to flash back to stock but everytime I flash it will failed. Any help? Is the phone being recognized? Odin should show a box with COM: and then a number if it is. Odin can detect my phone, it will fail when flashing process. Im using AP_N7100XXUEM16_CP_N7100XXEM16_CSC_N7100XAEM16_BY_WVAZ_DINK.tar. 4.3 stock rom but i use this rom before and works fine.